I contemplated making a video this week, but A) I only got two books, B) one of the books I got made me so excited I was afraid I'd embarrass myself by being a squeeing, gushing fan-girl, and C) I didn't feel like getting dressed and making my hair unscary. So. Here we are. Entwined by Heather Dixon. I've seen this book around quite a bit, and decided to read it as part of the January HarperCollins Imprint Challenge. I've started it already, but I'm not really far enough into it to comment. Let me give you a little back story first. A few months ago, I was doing a Top Ten Tuesday and the topic was something like books or series you wish more people knew about. I immediately thought of the Passport to Peril series by Maddy Hunter. I read them a couple years ago and loved them. They have everything - action, humour, romance, suspense, and I don't think I ever read one where I figured out the murderer before it was revealed. Plus, they helped satisfy my wanderlust because I can't afford to travel (yet). The series ended a few years ago and I was so sad. They were amazing and I wanted more! I would like to say a HUGE thank you to Maddy Hunter and Midnight Ink for sending me this book. Maddy is a real sweetheart - we're friends on Facebook and she's not one of those authors who friends you and then never speaks to you, we've actually spoken a fair bit. She even posted this on her fan page the day of my book release this past week: "Marie Landry is launching her first novel today on Kindle. She is a dedicated, hardworking writer who is to be congratulated for keeping her eye on the ball, getting the job done, and writing a charming novel that will please fans of good fiction. Yeah, Marie!!" I was stunned and touched, and can't even begin to tell you how surreal it was because she's been one of my favorite authors for years! Anyway, please forgive my gushing, I'm just super excited, and I really wish more people would read this series because it's fantastic. Pre-order Dutch Me Deadly on Amazon or The Book Depository. That is so great! I'll definitely have to look into Maddy Hunter and her books. I need to read Entwined, I have it sitting on my shelves waiting to be read. 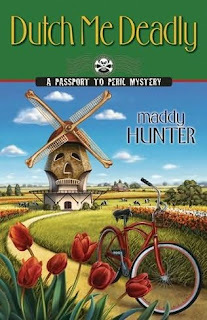 I have never read any Maddy Hunter books. They sound really good. I have Entwined and havent gotten to it yet. Thanks for stopping by my blog. Entwined is so lush and beautiful. You will love it!!! You have me intrigued with the Mandy Hunter Books, I am heading over to goodreads to ck them out. This sound like a good mystery series! I love mystery (I'm a big Nancy Drew fan). Great set! I've been meaning to read Entwined. It sounds great. Eeeee, congratulations! I'm so happy for you! :) I'll definitely have to take a look at her books!